Paul Taylor, provider of the following guest post, is an ex-nanny. Passionate about thought leadership and writing, Paul regularly contributes to various career, social media, public relations, branding, and parenting blogs/websites. She also provides value to nanny service by giving advice on site design as well as the features and functionality to provide more and more value to nannies and families across the U.S. and Canada. She can be available at taylor33.paul@gmail.com. Eager to learn and filled with curiosity, preschool children can present quite a challenge when it comes to keeping them entertained and out of trouble. 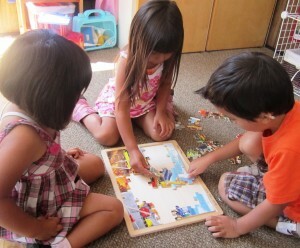 During this stage of their life, children are still learning about the world around them through play and structured activities, and having a variety of activities to keep them engaged and entertained is a must; through the virtual village that is the blogosphere, parents and childcare providers have access to a wealth of educational and entertaining activity ideas. The following 30 blogs prominently feature entries covering such subjects, making them a valuable resource for the adults charged with caring for preschoolers. Inclement weather and lack of access to safe and open outdoor play space can leave parents and caregivers scrambling for ways to keep housebound kids from going stir crazy. These activities are all structured around the idea of keeping kids engaged indoors, for times when outdoor play simply isn’t feasible. Research conducted by the Seattle Children’s Research Institute and the University of Washington indicates that many preschool children have few opportunities to engage in supervised outdoor play, which can support creativity, prevent obesity by discouraging sedentary habits, and strengthen developing motor skills. The benefits of getting young children off the couch and into the great outdoors are numerous; here are five blogs with ideas for active and stimulating outdoor play. Almost any play that a preschooler engages in provides them with hands-on, real-life learning experiences; however, there are some activities that help kids learn important concepts. Bloggers share their ideas for educational activities in the following five links. While keeping a group of preschoolers entertained and getting along can be a struggle, side-by-side and group play are essential for helping kids learn the socializing skills that they’ll carry with them as they get older. Parents and caregivers can keep tantrums and feuds to a minimum by encouraging structured activity during play dates, making the information included in the following five blog entries quite valuable. During the preschool years, kids are learning safety skills on a large scale, like fire or water safety, and also the basics of safe play in general. Helping pint-sized daredevils learn to play it safe and passing along the basic rules of safety in general can be done through active play, as detailed in these five posts. If your little one is on the verge of beginning a structured preschool program, it’s likely that quite a bit of your energy is dedicated to helping him prepare for this major milestone. From knowing what to expect to perfecting potty training, these five blog entries can help parents and caregivers get a child on the right track and ready for school. There are a staggering number of blogs on the Internet with a focus on preschool activities and other relevant topics, so don’t stop here! Check the links section in a favorite blog’s sidebar for others that may be similar.